Where do I use my Baby Security voucher code? Baby Security supply a huge array of baby products from huge brands like Chicco, Cosatto, Maxi-Cosi, Samsung, Venicci and many more. The baby products available at Baby Security include feeding products, safety gates, monitors, home safety, car seats, pushchairs, travel systems, baby care, toys and gifts and nursery products. So whether you’re looking for highchairs, bibs, trainer cups, breastfeeding products, stair gates, breathing monitors, guards, baby locks and latches, booster seats, travel costs, swimwear, soothers, baby changing products, soft toys, nursery furniture, or anything else, you are sure to find it at Baby Security. Baby Security ensure they keep prices low as they know that with kids, things often get broken and damaged and that nothing lasts long with the speed children grow at. Therefore you’ll find a number of products for children of all ages from newborn up to the late years, all of which are extremely high quality without compromising on affordability. If you’re struggling with what to buy you can always check out the buying guides section where there’s plenty of guidance on what products are best for your children. There’s also a fantastic sale section where you’ll find plenty of discounts and offers on a number of top brands. Baby Security knows exactly how hard it is to make decisions on things like which car seat to have, which bottle is best, what pushchair is suitable and a range of other questions that you need the answer to. Therefore in order to make your life a little bit easier, Baby Security have devised a simple Buying Guide which features all the information you need. In this section you can find information and guidance on feeding products, stair gates, monitors, home safety, car seats, pushchairs and travel items, baby care, toys and gifts and nursery products, so you’ll always have all the essentials information you need before you invest in any baby gear. Car seats can be a tricky business, and as your child needs one pretty much all through their childhood, you need to make sure you’re investing in one that does the job probably and one that’s going to last and adapt as your little one grows. With an extensive range of car seats from an array of brands, you are sure to find exactly what you're looking for at Baby Security. Shop through group 0+ car seats, group 1+ car seats, group 2 & 3 car seats, Group 1-2-3 car seats, all group (0+, 1, 2 & 3) car seats, booster seats and car seat accessories. You can also search through the most popular car seat products to see which ones other parents prefer, or shop via brand to find one from a name you can trust. Baby Security know that having a newborn baby can be an expensive job, even as children grow older they still require a huge amount of maintenance which can quickly add up. Because of this Baby Security provide a sale section where you can save up to 50% off a range of different items. Cut the cost of cribs, stair gates, seat belts, bottle sets, baby monitors, placemats and much more in the sale section and enjoy interest-free credit on a variety of orders, allowing you to buy now even if you don’t have the right amount of money saved. The sale section at Baby Security is updated regularly and have limited offers added every now and then, so there’s always a new way to save on your order. You are entitled to return any purchase within 14 working days from your order delivery date. Find more details here. Baby Security is an infant care specialist who provide baby products and equipment from the top, high-quality brands in the industry. 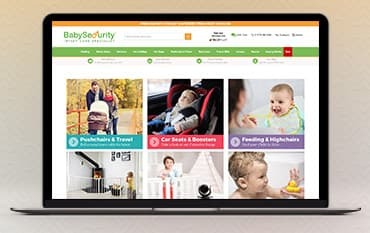 Whether you’re looking for feeding products, car seats, prams, baby care, toys or anything else, you can find it at Baby Security for a great affordable price. And, if you shop online with a Baby Security voucher code from us, you can save money on your baby care and equipment too. As well as a great array of products and low-cost prices, Baby Security also provides a price promise, interest-free credit, easy returns and free delivery, so you can buy with absolute confidence that you’re paying the best possible price for your baby stuff.